After finalising the pay period, simply click the ‘Export Payslips’ button within the Payroll function. 1) On the left hand side select the employees for whom you wish to export payslips. Several options for selecting which payslips to export are available by clicking the ‘Select By’ button. 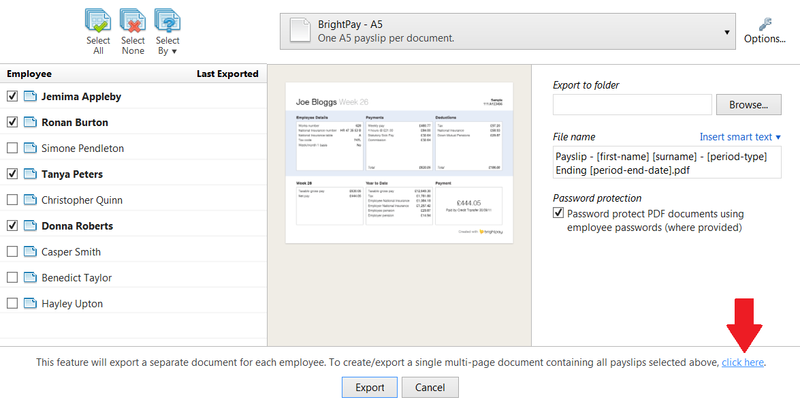 2) Should you wish to further customise your payslips before exporting, click the ‘Options’ button. This facility allows you to add or remove certain information on the payslip, for example add a company logo or remove the payment method details. 3) On the right hand side, select your 'Export to folder' location and enter a file name, either by manually typing this in the box provided or using the smart text facility. 4) If you would like to password protect the payslips, simply tick the box provided. Employee passwords must be entered beforehand within the HR section of their Employee record in order for the payslip to be password protected on opening. 5) When ready, click ‘Export’. A confirmation message will appear when the export has completed. 6) Once exported, you will see the date and time they were exported automatically populated under "Last Exported". 7) Payslips can be exported again at any time. 4) A preview of the payslips selected will now be displayed. Select Export PDF to complete the exporting of this document. 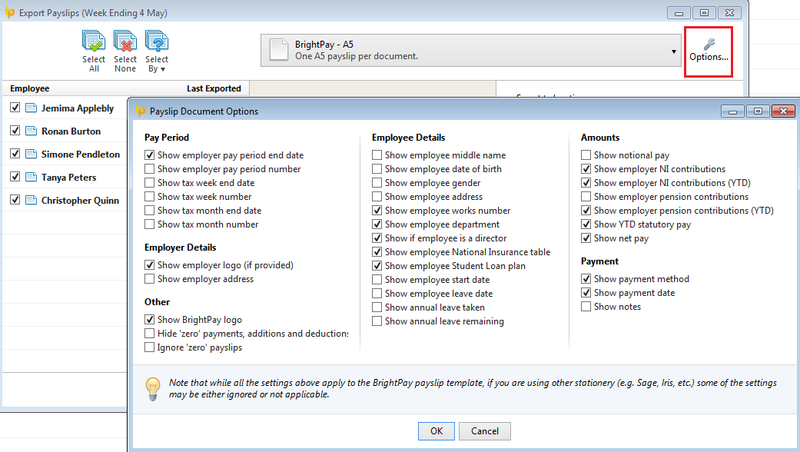 BrightPay allows for specific period payments, daily payments, hourly payments, piece payments, additions and deductions to be given a custom description to appear on an employee's payslip, if required. Please note: the customised payslip description will hold going forward until such time the user removes it.